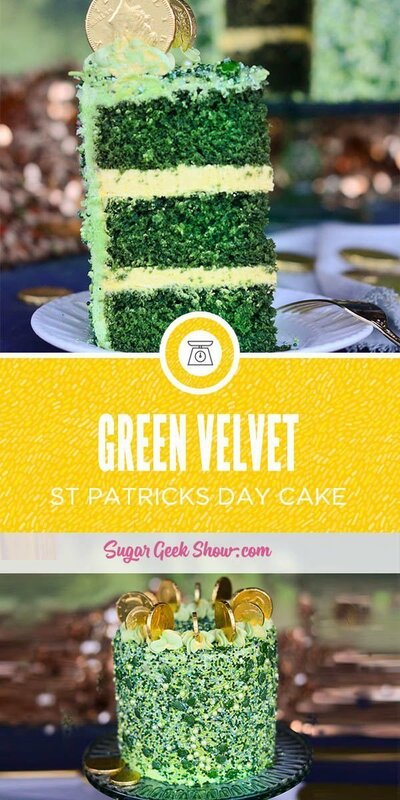 A St. Patrick’s day cake can be simple or elaborate, this one is a little of both! 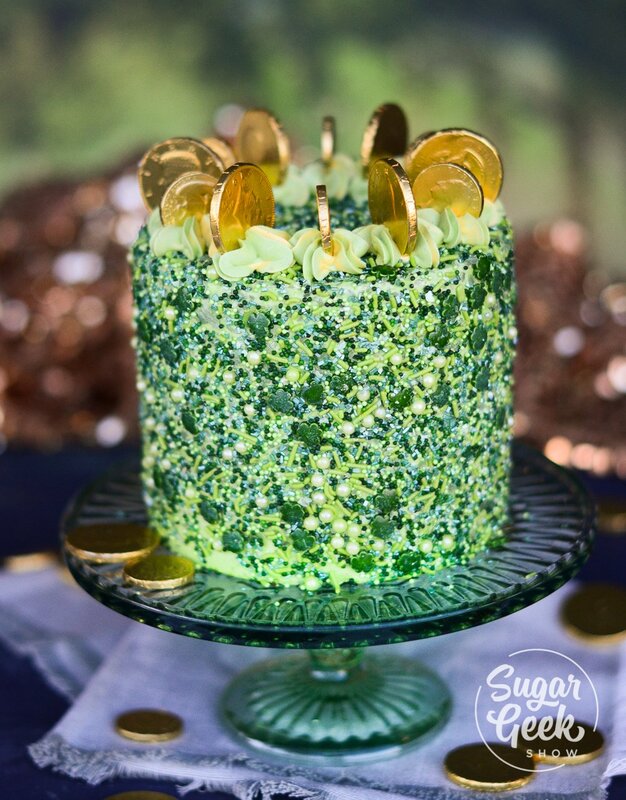 This St. Patrick’s Day cake is so fun to make and features some of my daughter’s favorite things, chocolate and color! St Patrick’s Day is a time to get together and celebrate with friends (and everyone pretends they are irish) which can be a lot of fun! This cake is perfect to bring to a get-together, bake up for the family dinner or just make for fun! For this cake, I converted my red velvet cake recipe to a green velvet by replacing the red food coloring with green. I left the cocoa powder in the recipe but cut it in half (1 tablespoon instead of two) so that the color was not quite as dark. For a brighter green, leave the cocoa powder out. 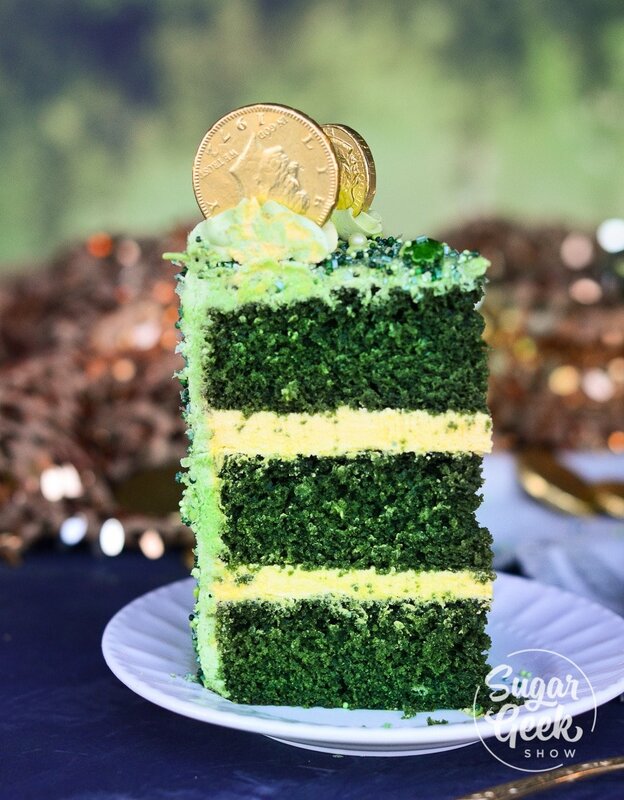 I love the riche, natural green color of this green velvet cake. The taste is really amazing and pairs really well with easy buttercream or of course cream cheese frosting. I love making sprinkles mixes! It’s kinda my new obsession. Yes I am fully aware that I am really late to the trend on this one but I get it now. Making your own sprinkles mixes is so fun! Many places like Michaels actually sell sprinkles by color so it makes it really easy. I got myself some shamrocks, a couple different sizes of non perils, sugar pearls and some green crystal sugar. I of course had to take this opportunity to make some edible glitter too! Combine all the sprinkles together and put them in a shallow dish to coat your cake and catch the sprinkles that fall off. Follow the directions for my edible glitter recipe but instead of blue shine I used green shine. You could also use food coloring with pearl sheen if you have that available. Spread it out, let it dry and grind it up. I crumb coat the cake with buttercream colored with some yellow and green food color. I like to use artisan accents chameleon chocolate colors because they are oil based and better for coloring buttercream. Let the cake chill until it’s firm. Then I put the final coat of buttercream on and smooth it out with a bench scraper. Next we need to semi-freeze the cake so it’s easier to pick it up to put the sprinkles on it. I accidentally froze mine a little to much so I ended up having to put another thin coat of buttercream onto the cake so that the sprinkles had something to “squish” into. Put the sprinkles onto the top of the cake first so that your hand doesn’t get all buttercream-y. You might have to occasionally skootch the sprinkles back into the middle. I finished my cake with a few dollops of buttercream and some gold chocolate coins. You can also make some matching cupcakes if you need more servings for something like your kids school party or a larger get-together. 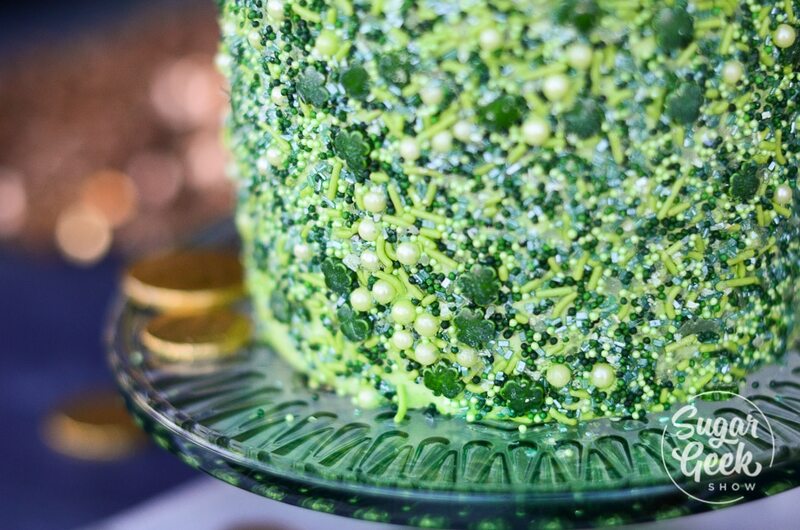 I hope you enjoyed this St Patrick’s day cake tutorial! If you tried it, let me know, I’d love to see it! Want more colorful velvet cake info? Check out my other blog post on all things white velvet cake and how to get custom colors. 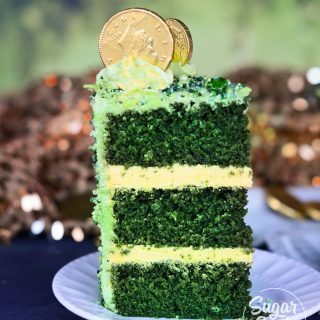 This green velvet cake is so fun to make for St Patricks Day or any other holiday where you need a pretty green cake that also tastes amazing! Adapted from my very popular red velvet cake recipe. Whisk up eggs with oil, buttermilk, vinegar and melted butter and food coloring until combined and set aside. Two 8″ cakes or three 6″ cakes. Is that the buttercream as the filling or did you use something else for your filling? 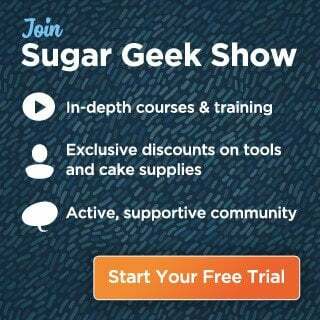 Does the buttercream really use 2lbs of butter? That seems like a lot….